Eldorado is a fantastic new hard rock band from Spain which draws deep from the well of classic rock. Their influences, which are clearly heard on their debut album, include Deep Purple, Led Zeppelin, Rainbow, Glenn Hughes (early) among others. For their debut album they enlisted well-known producer and engineer Richard Chycki (Aerosmith, Mick Jagger, Rush, Seal, Def Leppard et al) who easily brought out their confident style of hard rock. 'En Busca De Eldorado' roughly translated means 'in search of the golden one' (Eldorado is also the mythical city of gold somewhere lost in South America). If your searching for some great hard rock in a classic vein with guts and soul, look no further, it's here in Eldorado. By far the most excellent track on the album is the title song. It's filled with energy and enthusiasm as Eldorado easily moves through a varied arrangement of tempos. If there will ever be a signature Eldorado song, this may be it. As for the cover of 'Mistreated,' expect to pleased with Eldorado's rendition: between Trujillo's vocals, Nano's guitar and the excellent rhythm section of Planelles and Sanchez, you will think you tripped into a time machine. Add to this the killer Zeppelin inspired closer 'Identidad' which mixes rock, metal, and blues and you have a nearly perfect album. One, it could have been longer: two or three more songs would have been great; and, two, singing in English would have probably boosted their mainstream acceptance. 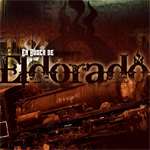 Eldorado's 'En Busca De Eldorado' is first class, straight to heart, fist pumping, head banging hard rock. Few bands deliver with such passion and clarity on a debut work, but Eldorado nails it. Excellent stuff and highly recommended!